Right, I'll admit it upfront - I don't know much about North Indian food. I had to google to find the subtle (and some not so subtle) differences between various NI cuisines. But food is a universal language of communication, well prepared food speaks its own language and has its own syntax. The one thing I am certain about is that my spell check will go crazy by the end of this post. 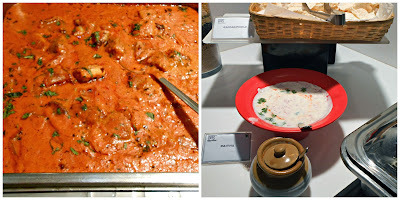 The ongoing Awadhi food festival at Keys hotel Katti-Ma (http://www.keyshotels.com) Thiruvanmiyur was the reason for this sudden need for food education, especially as the hotel is located in the neighbourhood. The festivities happen at the Keys Cafe, a charming space, and at the flower motif-ed entrance, service staff dressed Awadh style welcomed us with the traditional application of attar (perfumed oil) on our wrists. The buffet was neatly laid out, beginning with some very un-Awadhi salads. We were told that some diners preferred the regular menu and so this was for their benefit. We started the meal with murgh galauti kebab. Served with mint chutney, the kebab was melt in the mouth tender. Just the way toothless nawab wanted it, I guess. The spices were subtle and well balanced, the meat was definitely the hero. Then there was a plate of paneer dhungara tikka- soft, well marinated paneer pieces. They would have tasted better if they were hot. Along with the kebabs, we had sheermal and ulti tawa ka paratha. The sesame studded sheermal was not too sweet but our favourite was definitely the ulti paratha. It was the perfect accompaniment to the kebabs. The soup on offer was murgh hara dhaniya shorba. Light and flavourful, spicy with a hint of coriander. Dal rohili, made with urad dal, looked interesting, opening the cover of the chaffing dish, the aroma was unbelievable. It was a match made in heaven with the mewa pulao. I particularly liked the kaju kumbh makhana, beautifully cooked mushrooms studded with cashew halves. Simply yummy!! 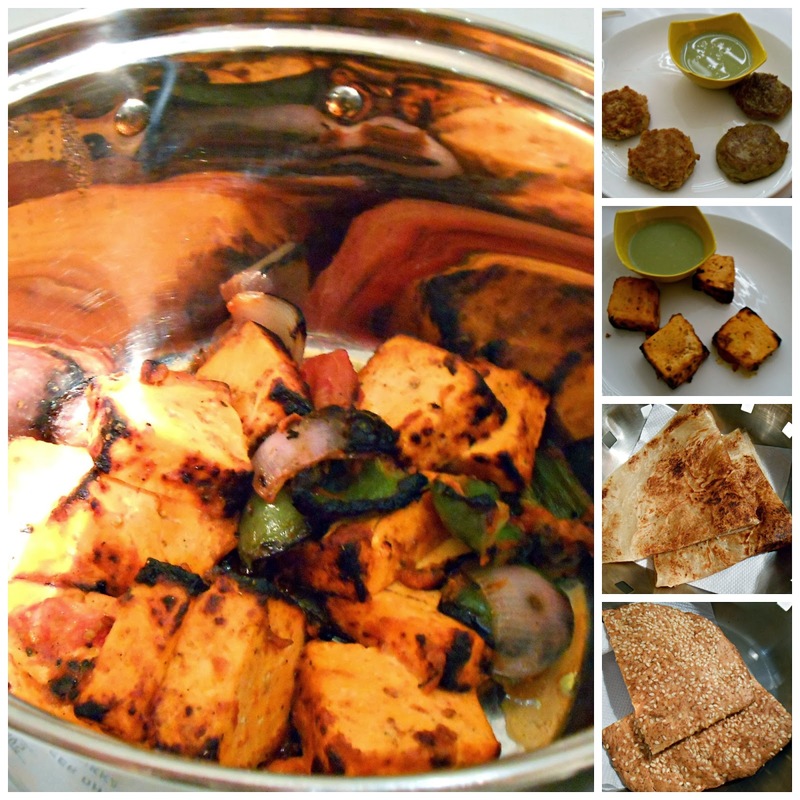 The ambali paneer with the diamond shaped paneer pieces was tempting, the richness of the cashewnut paste added to the thickness of the gravy but I left it to my son to pronounce the verdict- delicious. 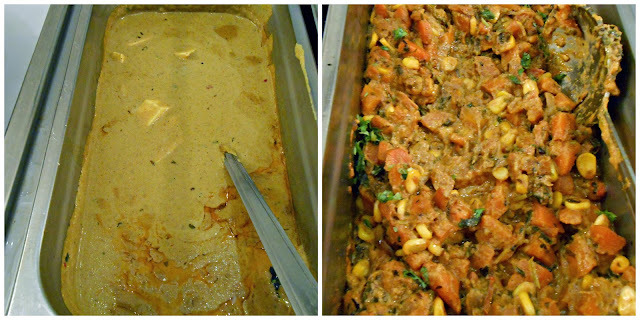 There was also a gajar makkai ki tarkari- a dish of carrots and corn. Both my son and I gave it miss- we are unabashed non vegetarians. 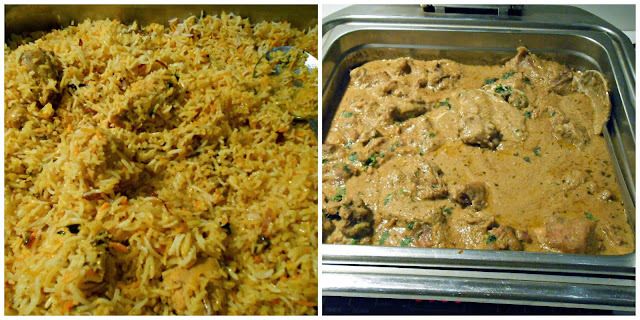 Murgh awadhi biryani was definitely the star of the evening. Fragrant, flavourful, hints of rosewater, saffron, each grain of rice separate but beautifully moist. And the perfect accompaniment had to be the dum ka gosht, tender pieces of lamb cooked in a plethora of spices, nuts, cream. Oh those Awadhs sure know how to make you forget your diet plans. And yes, there was also a tamatari machili made with basa fillets- not our fish of choice. 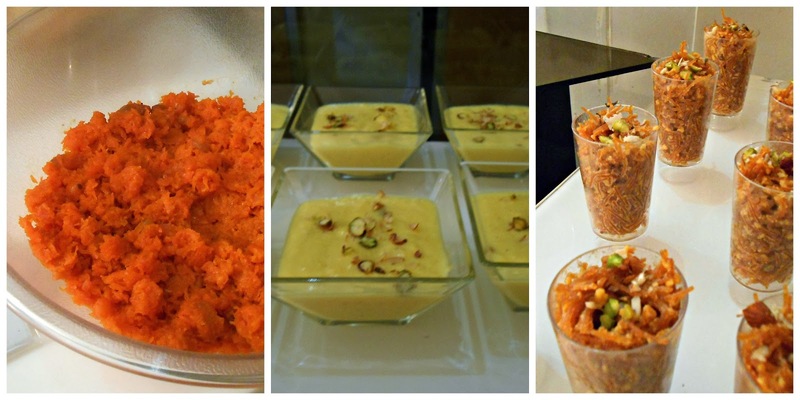 The desserts on display included carrot halwa, zafrani kheer and siwai ki muzafar. All three were delicious, studded with slivers of almonds and pistachios. The kheer was outstanding, the flavour of saffron was a subtle hint rather than a bold statement. I think the chef was suitably impressed with all the photographs I was taking that he brought me a bowl of his special dessert - halwa-e-gosht. Ok, that was a bit of a shock - a dessert with meat? I must admit this took a bit of courage to try, not to mention the glass of water I had to drink to cleanse my palate. The water was also to buy some time as the chef was waiting for my...err...reaction/comment? Finely ground lamb cooked with khoa and mildly sweet. An unusual combination, rich, yes, at the same time, savory notes playing on my tongue. Looks like the old Lucknow cooks knew a thing a two about fusion food!! I think for me, it was a good introduction to Awadhi cuisine. The dishes were rich, mildly spiced, each of them had a unique flavour. Service was unobtrusive, but it did take some time for our plates to be cleared. Piped music added to the ambiance of a leisurely meal. There are other un-Awadh dishes at the extensive buffet spread, just in case someone likes something else. There was a little boy who came in with his parents, looked at the dishes and then pronounced that he would love to have the noodles. 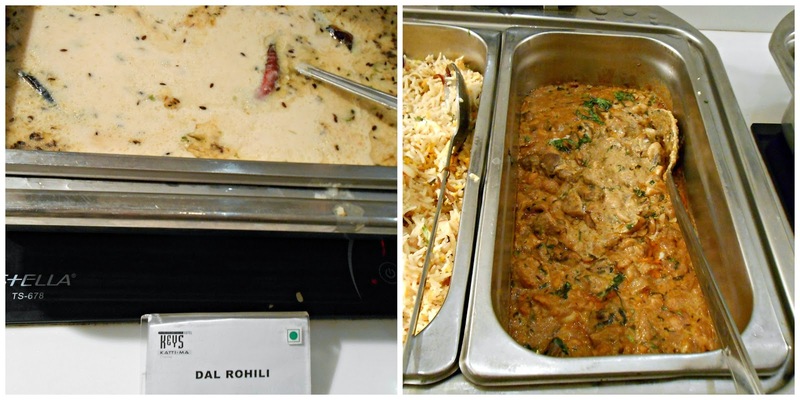 The Awadhi dinner buffet, inclusive of a glass of wine/ mug of beer is priced at Rs.600+ taxes if you choose to go on Friday, Saturday or Sunday. The weekday buffet is Rs. 400+ taxes. The festival is on till Sunday November 24th. Here's a helpful tip- skip lunch and indulge at the fest.